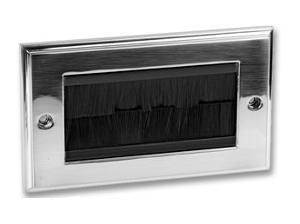 Brush plate are an excellent low cost alternative to AV connection plates, cables are fed through and exit the brush opening, ideal for when concealing to TV cables in the wall. The plates fit any UK double gang back box and come complete with a pair of fixing screws. This plate is also available with white brushes and can be used for any type of cabling, conduit or pipework. Brush plates can also be used in furniture to pass TV cables or computer cables through desktops or cabinets.